A carnet de bal, or dance card, was a fashionable accessory often carried by women attending a formal dance to record the names of the gentlemen with whom she would dance over the course of the evening. Occasionally, the carnet de bal would be executed as a fan, allowing a lady to write down her dance partners on the fan’s blades. 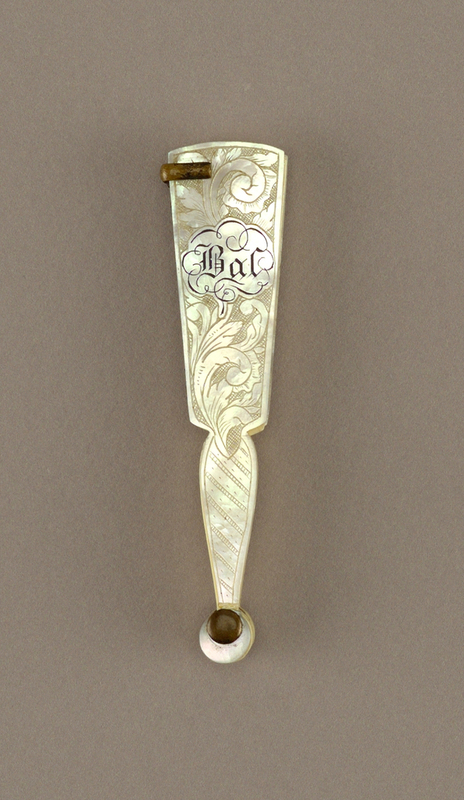 Behind its carved mother-of-pearl front guard, marked with the word ‘Bal’, this nineteenth century French dance card fan features six ivory blades for writing, and a metal pencil holder on its right side. Measuring three inches long, and only three-quarter inches at the guards’ widest point, this carnet de bal fan was certainly never intended to provide any substantial relief from the heat; rather its significance lies in its symbolism. A look at surviving examples indicates that the use of dance cards became popular amongst European courtiers in the last half of the eighteenth century, later to be adopted in American ballrooms. They remained in vogue into the first decades of the twentieth century, but began to fall out of favor in response to shifting cultural ideals. Jazz culture in particular became a powerful expression of modernity, and had an impact not only on music and social dance, but also on fashion and comportment. More generally speaking this period also saw the growth of industry and cities, the outbreak of world war, and the expansion of women’s roles in society, thus the dance card became representative of a bygone era. At the height of its fashionability, however, the dance card was an important social tool that straddled the lines of fashion and function. Though it is sometimes cast as an object of novelty or feminine trifle, the dance card served to enforce a well-established etiquette of dance, gender roles, and a certain social milieu, while at the same time expressing prevailing aesthetic attitudes.